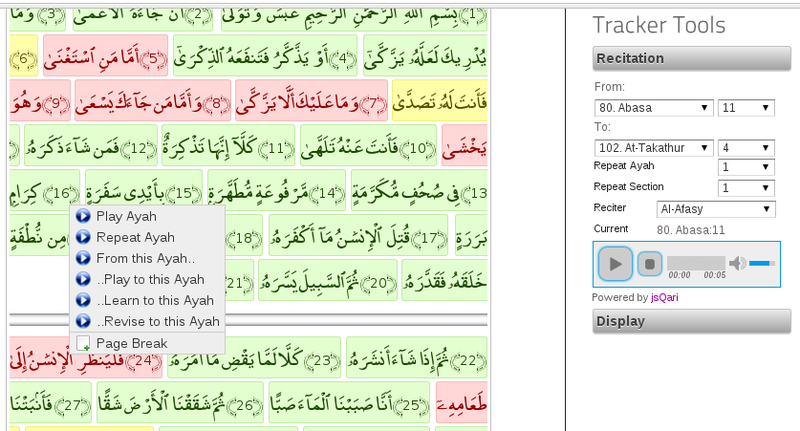 The Quran recitation player now allows to select a start position and an end position to start and end your recitation. Also you can repeat ayahs a number of times and you can also repeat the section (i.e. from start to end) a number of times. You can select your start and end position directly on the recitation player or you can select it from the surahs in your hifdh or revision tracker by clicking and holding on the ayah and selecting the appropriate menu option when the menu comes up. Just put your mouse over the ayah that you want to start from and click and hold and then select ‘..From this ayah’, and then put your mouse over the ayah that you want to end at and click and hold and then select ‘..Play to this Ayah’. This will play the portion once with each being played once. To help with learning new portions of the Quran and to help with revising portions you’ve learnt, we’ve added a couple of options to the menu to make it very easy and fast to do what you need to do. The ‘..Learn to this Ayah’ option plays the portion repeating each ayah 10 times and the ‘..Revise to this Ayah’ option plays the whole portion 10 times (each ayah being played once). We hope that these new features in the recitation player will make it easier for you to learn and revise the Quran inshaa Allah. As always, your feedback is very welcome. Jazaakum Allahu khair. Posted on 11 August 2013, in Uncategorized. Bookmark the permalink. 4 Comments. Nice, I think that would really help me. Alhamdulillah glad to hear that out would be useful for you inshaa Allah. quran tracker is a good effort. The administrator must also look into the typographical errors in the quranic text and try to remove them as soon as possible for example verse number 86 surah Al- baqarah “ILA ASHADDIL ADHAB is written as ILA ASHADDAL ADHAB”. Assalamu alaikum, Jazak Allahu khair for your comment. Please note the error you are referring to is not an error, it is the way the script is written. If the harakah is underneath the shaddah then it denotes a kasrah whereas when it is above the shaddah then it denotes a fatha. In both of these cases the harakah is below the shaddah so they are kasrahs. I hope this clarifies the issue inshaa Allah.